The World of Mr Casaubon takes as its point of departure a fictional character - Mr Casaubon in George Eliot's classic novel, Middlemarch. The author of an unfinished 'Key to All Mythologies', Casaubon has become an icon of obscurantism, irrelevance and futility. Crossing conventional disciplinary boundaries, Colin Kidd excavates Casaubon's hinterland, and illuminates the fierce ideological war which raged over the use of pagan myths to defend Christianity from the existential threat posed by radical Enlightenment criticism. Notwithstanding Eliot's portrayal of Casaubon, Anglican mythographers were far from unworldly, and actively rebutted the radical freethinking associated with the Enlightenment and French Revolution. Orientalism was a major theatre in this ideological conflict, and mythography also played an indirect but influential role in framing the new science of anthropology. 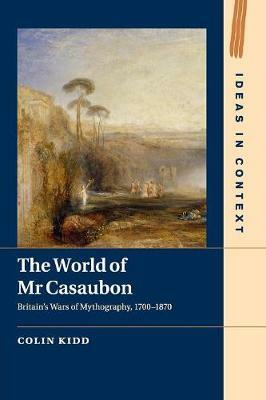 The World of Mr Casaubon is rich in interdisciplinary twists and ironies, and paints a vivid picture of the intellectual world of eighteenth- and nineteenth-century Britain.